After the railroads were built through Northwest Indiana in the mid 19th century, anyone could experience the “Everglades of the North” of the Kankakee Marsh. Amongst the throng of adventurers were the rich and famous of American society. Hunting, for the upper crust, was a social hobby where like-minded men came together in congenial surroundings; to escape their daily obligations. Eventually, many formed clubs and built clubhouses on the marsh. A large concentration of these clubhouses were located at Baum’s Bridge. Through my research I have established the locations of the larger clubhouses. However, the Crawfordsville Fishing and Shooting Club’s location has eluded me. Lew Wallace was a member of the Crawfordsville along with his friend, James Madison “Maurice” Thompson. 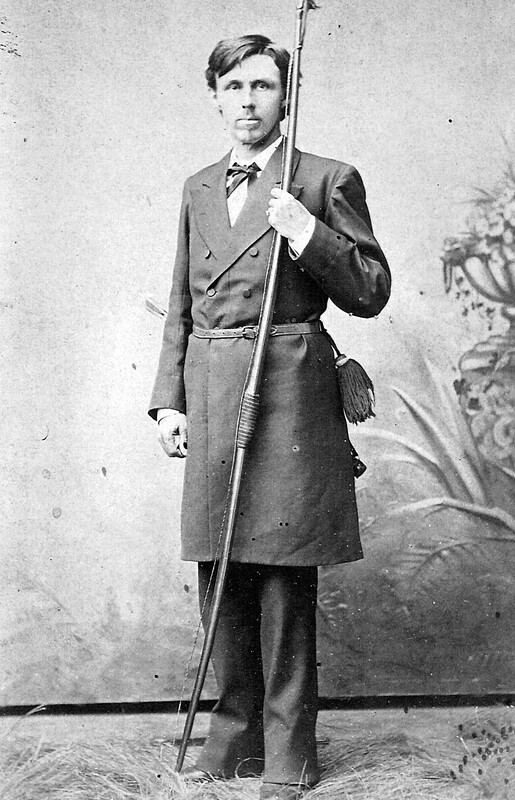 Thompson was born on September 9, 1844 to Grigg Thompson and Diantha Jagger Thompson in Fairfield, Indiana. Maurice was especially close to his brother, William “Will” Thompson. Will was born in 1846 in Missouri. In 1855 the Thompson family moved from Kentucky to Calhoun, Georgia. Their new home was near the beautiful Coosawattee River Valley forestland. The Thompson brothers were “one with the outdoors”; much of their time was spent romping through these scenic woods. These idyllic days would soon end, when the clouds of war passed over their peaceful land. Maurice saw this as a new adventure: and in 1862, at the age of 17 he joined the Confederate army. His father soon followed the call to arms, and brother Will joined two years later. Maurice was a scout for the 63rd Georgia Infantry, rising to the rank of Sergeant. Wounded and taken prisoner, Thompson was paroled in Hampton, Georgia on May, 12, 1865. In 1868, after their return from the war, Maurice and Will moved to Crawfordsville, Indiana where Maurice worked as a civil engineer for the Indiana, Bloomington and Western Railway. Later in 1868 Maurice married Alice Lee, the daughter of his employer. Will married Alice’s sister, Sarah, in 1874. In 1871 Maurice took up the practice of law: and also began to write poems and short stories. Thompson’s engineering background became useful when he was appointed the Indiana State Geologist — serving from 1885 to 1889. He gave up his law practice in 1889 — devoting much of the rest of his life to writing. A few years later his wife inherited a house in Crawfordsville, where Maurice’s friendship with Lew Wallace deepened. Maurice and Will had developed an interest in archery during their youth in the Georgia backwoods; which evolved into a passion in Crawfordsville. 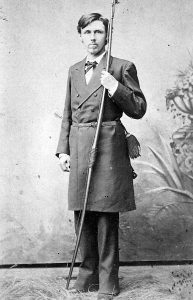 One humorous story tells when two former Confederate friends, while visiting Maurice, challenged Lew Wallace and his friends to a shooting match. Maurice’s group used bow and Lew’s used rifle. At the end of the day Maurice’s team won! A lot of controversy surrounds hunting. Putting the controversy aside—have you ever wondered why, with the reliability of firearms, that there is a revival of archery? Many consider J. Maurice Thompson the father of modern archery. Thompson served in the Confederate Army during the Civil War. After the war, either because of choice or another account has it that ex-Confederates were not allowed to own firearms. Maurice and his brother Will began improving archery equipment and techniques. Thompson took up residence in Crawfordsville, Indiana in 1868 and was the Indiana State Geologist from 1885-1889. While traveling Indiana, performing his geologist duties, he spent a fair amount of time in the Kankakee Marsh region. Additionally, Maurice was a member of the Crawfordsville Fishing and Shooting Club headquartered out of Baum’s Bridge. He became interested in the history of the Kankakee River, specifically the Cavelier Siour de La Salle 1679 exploration of the Kankakee. Thompson decided that he would retrace the LaSalle route. With a transcript of Father Hennepin’s in hand he started at the St. Joseph-Kankakee portage near South Bend. Thompson was state geologist at the time and “wished to be quite alone and quite unknown during this outing; for the politicians had their eyes upon me, and what would they have said of a state official who played “hooky” in the woods with a bow and arrows, when he should have been in his office chair with a case of fossils before him and looking as grim as Diogenes?” Gosh, bosses never change! Thompson’s only cover was a “rubber blanket stretched over some stakes” and his boat was a canvas covered frame boat. This was a leisurely journey, and he would camp for up to five days at any time. Unlike LaSalle’s exploration in winter, Thompson’s was in May. Thompson took meticulous notes and planned a lecture series about his Kankakee River journey. I have found no record if he followed through with the program. In the past, studying animals meant bringing them down. Not an easy task while studying birds with bow and arrow your means of capture. Thompson told an amusing story about his capture of a fine example of an American Bittern. By this time in his journey he had no arrows to lose. He began at sunrise. He hung his bow around his neck and very slowly crawled to the “thunder pumper.” It took Thompson two hours and 11 arrows until he “bowled it over in the air.” He did his dissection in the field and took detailed notes. That is dedication! I will post the whole story at our website. At the end of his journey he found his clerk back at the Baum’s Bridge clubhouse just north of the historic Collier Lodge with his mail, and discovered the need to return to Indianapolis on the next train. So ended Thompson’s fortnight journey of the Kankakee River. After reading his description of the Kankakee I get a greater sense of the beauty of the river before it was “straightened.” Clearly there is a need for more restoration work along the Kankakee River. We broke this machine close to a hundred years ago and we now need to repair it! In my last River Bits column I wrote about James Maurice Thompson and his affiliation with the Crawfordsville Club at Baum’s Bridge. Thompson was a man of many talents and interests. Professionally, Thompsons’s careers include that of: attorney, civil engineer, geologist, naturalist and noted author. 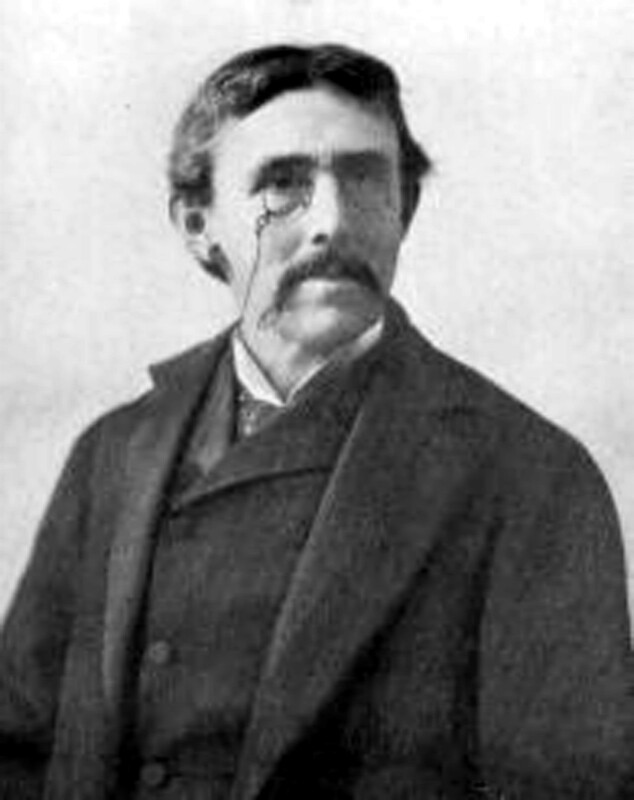 I place Thompson on my list of Hoosier Renaissance men near the level of Lew Wallace. Like Wallace, Thompson truly loved nature and the outdoors. As a sportsman, his weapon of choice was the bow. 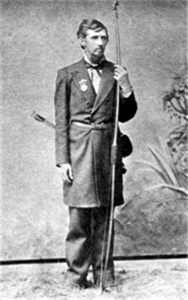 It has been written that Thompson’s attraction to archery was because former Confederate soldiers were not allowed to own firearms. But, the Thompson brothers were shooting bow and arrow as young lads in the Georgia woods. 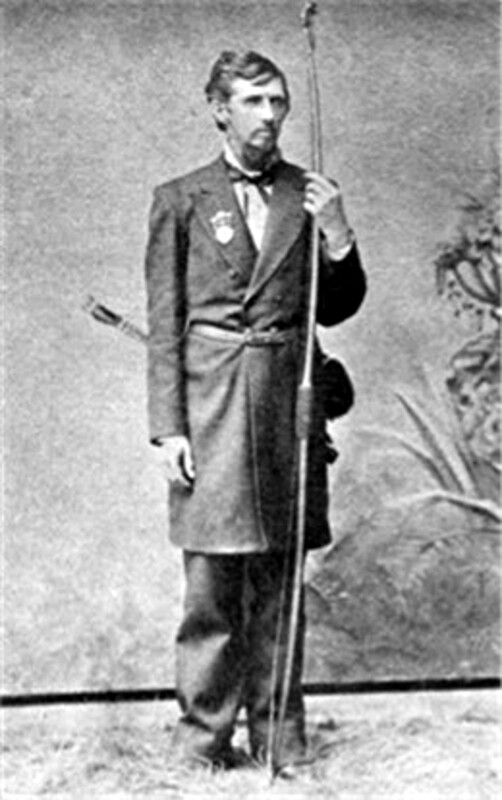 Thompson later wrote: “I was taught the use of the long-bow by Thomas Williams, an old hermit of a fellow, whose cabin stood in the midst of a vast pine forest that bordered my father’s plantation in North Georgia.” In 1878 Thompson authored: “The Witchery of Archery.” In 1879 the Thompson brothers founded the National Archery Association in Crawfordsville; and are considered the fathers of modern archery. 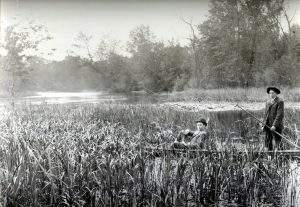 Thompson’s love of the outdoors and desire for a bit of adventure came together in the early 1880s when he decided to follow LaSalle’s 1679 exploration the Kankakee River. Setting off in his canvas boat near the St. Joseph and Kankakee Rivers portage Thompson began his journey. Although, he had brought some provisions, his main source of meat would depend on his skill with the bow. I have been asked many times why there was so little resistance to the draining of the Kankakee Marsh. There was some opposition, but not enough to stop the dredges. In 1882 James Maurice Thompson wrote “On the Kankakee” to challenge the Kankakee Marsh drainage proposal. Soon after Indiana was granted statehood in 1816 there was a push to increase settlement of the marshy area in the northwest corner of the state. The first group of pioneers to settle in a newly opened land is farmers. For farmers to break ground they must be assured of a means to get their harvest to market. Indiana officials saw the great success of the Erie Canal that opened in 1825, and thought this may be the solution. If the Kankakee Marsh was drained and channelized it would open new land for cultivation and the resulting canal would provide transportation of produce to market. Bonds were floated and funding for construction was ordered. Because of corrupt politicians and contractors the money was squandered with little results seen. Indiana nearly went into bankruptcy. As time went on there was some small scale drainage work done by landowners, but this work had little impact on the marsh proper. Then in 1882 a state report came out recommending the marsh be drained and the river turned into a ditch. A plan was developed and Indiana began the process to implement the channelization. Although, it would be another 35 years before the Kankakee Marsh would be drained this recent proposal started some thinking about the ramifications the project would have on the wildlife of the marsh. 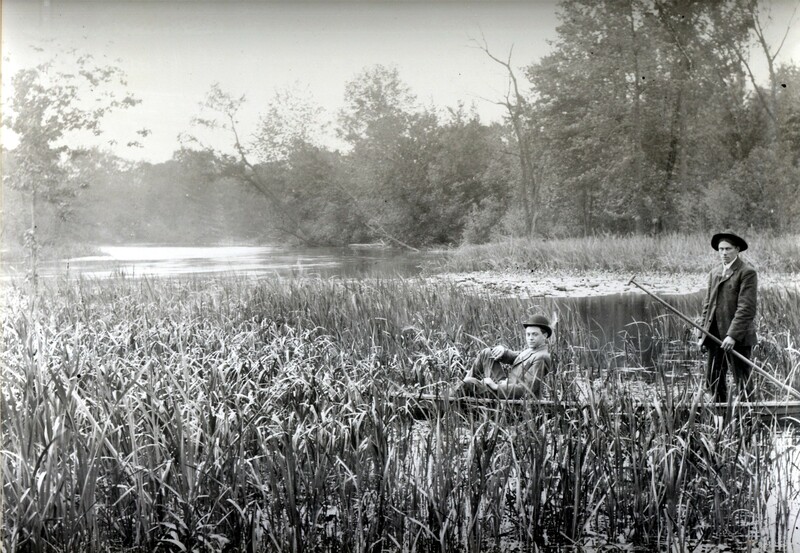 Thompson’s love of nature and the great outdoors led him to submit for publication, on May 8, 1882,”On the Kankakee”. Thompson’s 1882 article is the first scholarly argument in opposition to the drainage of the Kankakee Marsh I have found in my lengthy research. Thompson continued his passionate writings on the preservation of our great outdoors until his death in 1901.